Let me preface this inaugural blog post by stating I used to be a better blogger. One of my first blogs was here, with the ominous title of Cosmic Thoughts. It was a hodge-podge of random thoughts while I was a PhD student trying to finish a dissertation. I created original (“minimalist”) cartoons and posted them, described dreams, and contemplated my punk rock attitude. My second blog, more professional, started around the same time, as a PhD Student at UT Austin in the Language and Literacy Studies program. Inspired in 2004 by a plenary speech by Colin Lankshear and Michelle Knobel at NRC (now Literacy Research Association), “From Pencilvania to Pixelandia: Mapping the Terrain of New Literacies Research”, I eagerly became a blogger. Then I quit. I am committing now to becoming a better and more regular blogger. The title of this blog, Virtual Gadfly comes from both my roots as an undergraduate philosophy major in Southern California and also from being a lifelong question-poser. My own thinking is primarily grounded in Vygotsky, a passion for the study of new literacies, and a desire to make an impact on the ways we teach, learn, and think about knowledge and knowledge-sharing. I am not a knowledge hoarder or a knowledge guardian; instead, I am intentionally a knowledge-sharer, a bringer, and a facilitator. This blog will explore emerging topics and ideas related to the use of technology in higher education, mainly, with further blog posts relating to ideas broadly related to K-12 learning. Here I share photos of that tour and my thoughts on some of what I saw and learned. Many lessons were learned but here are a few, now that I am back in the Metroplex. Design spaces with IdeaPaint all over the walls are really cool and a good idea. How can we do that at UT Arlington?? Many of the walls at HarvardX are covered with this magnificent, specially installed paint where course designers and others involved with this process can write on the walls. Just today at the LINK Lab, we were discussing the fabulousness of IdeaPaint and how to do something similar, even if with large white boards. While we spoke I imagined what I would write on the walls. What is it about blank white walls that encourages knowledge sharing? I think it’s an exciting idea and I hope writing ideas on walls happens one day at UT Arlington. 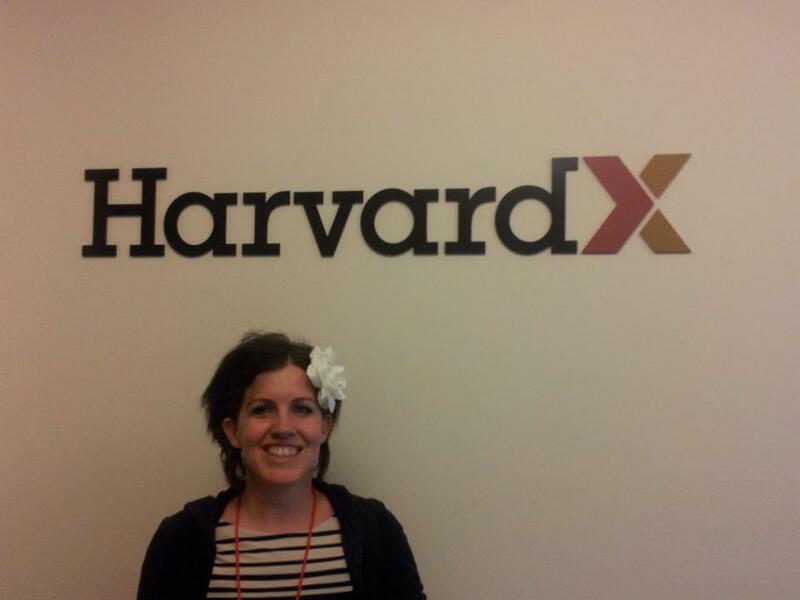 Catching an inside glimpse into HarvardX. To use an overused phrase, why “reinvent the wheel” in terms of having multiple production spaces when one really really good one can be put in place? I was impressed with the video production space in the ground floor of the Widener Library. 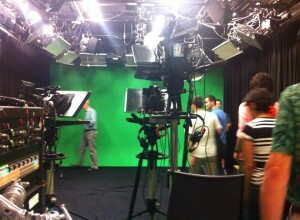 Here is the video production studio. I was pleased to hear they use an iPad-based teleprompter app. This year I hope to gain new skills beyond my Do-it-Yourself video production into more professional-looking videos. HarvardX has a “Three R” focus: Reach [large numbers of students], Research [studying their own MOOCs and learning from the data], and I believe the third was “Reciprocate for Residential”, meaning that they took what was innovative and effective about the MOOC style of teaching and took it back to the face-to-face classroom (e.g., using video to teach technical points) as ways to innovate in the traditional classroom. I especially liked the last R! The pic with the quote below sums up a wise approach to teaching and learning. “Knowledge is…the most important current of the 21st century.” -Drew Faust, President, Harvard University. That is all for now about HarvardX. Much more was learned! Stay tuned for more blog posts on my journey with the LINK Lab, learning how to use SmartGlasses, wanting to become a cyborg, what I’m reading, my take on EduPunk, and more!